WOW! 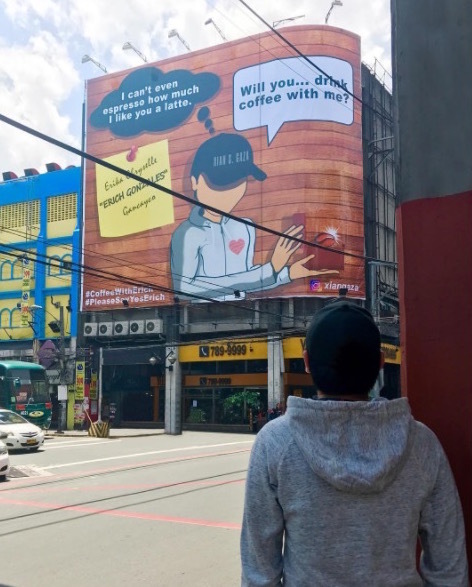 This guy paid for a billboard, just to invite Erich Gonzales to drink coffee with him! Based on my initial research, Xian Gaza is the president of a business company based in Hong Kong. Further searching on the net revealed that he is the same guy that went viral a few weeks ago, after his encounter with a networker whom he taught about what "power move" really is. 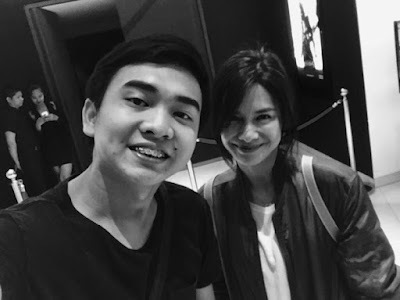 At idinaan niya rin pala sa FB niya kung paano mas okay i-approach si Erich. Look! I stalked his IG account and found out that he is also a business partner and close friend of Ogie Diaz. So I immediately called Mama Ogs up to verify the billboard post, and he said he'll call Xian. And yes daw, Xian wants to date Erich. And aliw, murag bisdak pud ni si Xian! I sent Erich messages already, I will update this post as soon as she replies. 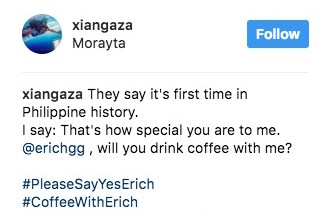 Nakausap ko na si Xian now and he met Erich daw pala last January 5, 2017 sa UPTown Mall Cinema, pero that time daw ay committed pa si Erich. Pero mula noon daw, hindi na nawala sa isip niya ang beautiful actress. When your dog hears DESPACITO! Hahaha! VIDEO: Kobe Paras, Kiefer Ravena and Jeron Teng!